One key component of being governor of Oklahoma is to pander to the folksy, right-wing rural base that got you elected. Kevin Stitt – the wealthy big city mortgage banker who’s probably foreclosed on more farms than he’s actually worked on – knows this first hand. 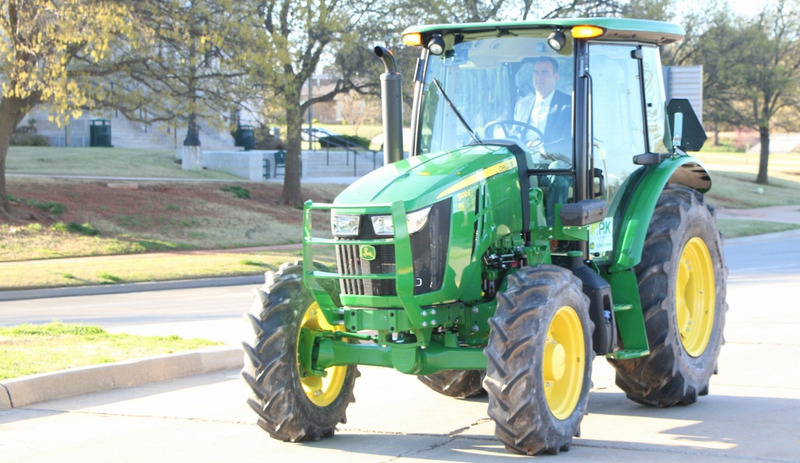 Yesterday, as part of Agriculture Day celebrations, he drove a John Deere tractor from the Governor’s Mansion to the Capitol. I’ve never driven a tractor in my life, and probably never will, but if I did, that’s probably the same deer in the tractor lights face I would make. Just like with tractors, I’ve never wore a pair of boots in my life, and probably never will, but if I did, they’d probably look like the ones the girl is wearing on the far left. Are those even boots? Are they half boots? Hoots? I’m confused. Anyway, now that Kevin Stitt drove a tractor to work for Ag Day at the Capitol, you have to wonder what he’ll drive for the next Oilfield Prayer Day. Will he pick his Cadillac, Mercedes or King Ranch? Also, what POS will he drive to work for the next Teachers Day? I bet he’d just borrow the woman wearing the half-boots Camry. The only vehicle suitable for Oil Field Prayer Day is a “Rolling Coal” Ford F350 Super Duty Deisel Dually, well unless Stitt is a Chevy Guy and not a Ford Guy. 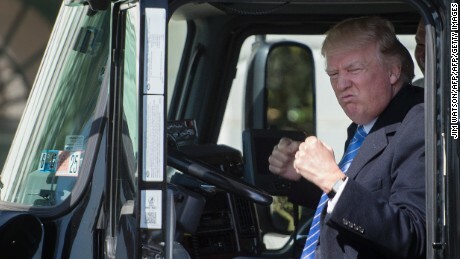 Trump pretend driving a big rig. Notice the small hands. And the cops closed down Lincoln so he could do it. I’m sure supervisors were understanding towards the employees who were late due to this stunt. Someone could have actually gotten their last strike today and lost their job because enough rural voters are stupid enough to be impressed by someone driving a tractor on the road and wearing cowboy boots one day a year. Kevin ain’t no Boren/Turpin/Edmondson/Ogle dude. I’ve heard the multiple Ogle dominated OKC news media is setting on a blockbuster story that polish navel intelligence interfered in Oklahoma’s election. Who polishes a belly button? They need the boots to wade through all the BULLSTITT!!!!! Reminds me of Trump’s First POS Interior Secretary, Ryan Zinke who rode a horse to work in DC on his first day, shutting down traffic. Now what happened to him? Good thing is if it had rained he has built in windshield wipers above his eyes. That tractor should be pulling a manure spreader. Instead of being driven by one? It’s a growing trend, apparently. Buried elsewhere is a press release from the Oklahoma Department of Transportation lauding the reduction in the number of dangerous and deficient bridges and the announcement of a new highway commissioner that being the former Speaker of the House TW Shannon. He is given credit for legislation that made the good news about bridges possible. Hog wash. What he did was pull money from the general fund and sent it over to ODOT which came at the expense of education money now funded in the bottom five in the nation per child. Great. 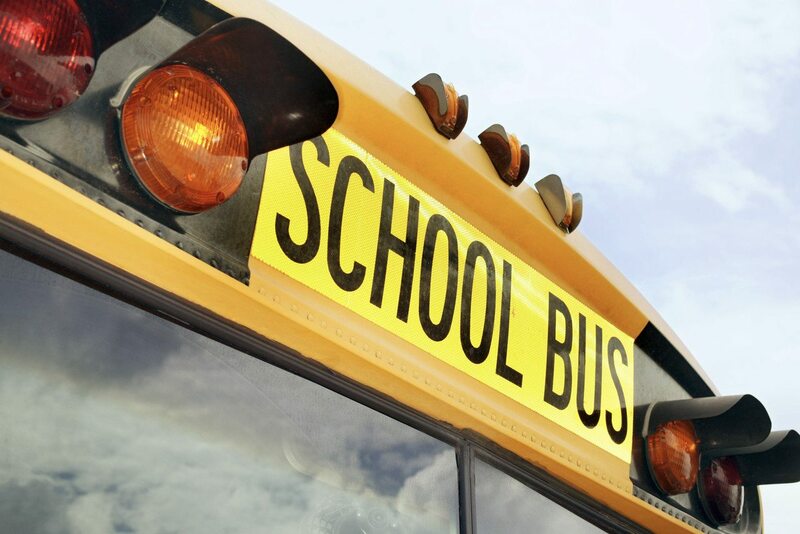 Now kids can get to overcrowded classes, taught by non-certified teachers perhaps quicker and more safely. Shannon stayed as speaker just long enough to drive up the state deficit to a billion dollars, then ran for the United States Senate, lost and now he’s over at ODOT doing God knows what. Well I know what. Having watched this political game for a bit his banking connections and a seat at the table distributing highway money will make for a cosy relationship. Don’t think so? Time will tell. He’s knows about as much about the 8 year highway plan as Pro Tempore Greg Treat does about driving that John Deere tractor. Me. I’ll just stay with my 1958 8-N. More reliable especially if you are steering one in a pasture east of Lexington rather than just tying up traffic in OKC. More useful too. I can see the hate is already starting. When your choice doesn’t get elected, you immediately start the demonizing. I actually started the hate when he immediately signed the permitless gun carry bill into law. Didn’t take long to get a reason. I’d hate Drew Edmondson’s political stunts too, thank you very much. What – no references to the old Green Acres TV show?! ?